Superhot is a game where time only moves when you move. That’s epikinetic time. And in Sightline: The Chair, anything can change whenever you’re not looking. At one point you’re trapped in a room with no doors or windows, and the more frantically you look around, the more rapidly the walls close in on you, without you ever seeing them move. That’s epikinetic action. So epikinesis is everything that is happening as part of movement in excess of the motion itself. Epikinesis is not native to VR. Epikinetic time has been done at least as early as 2008’s Braid, there as a 2D platformer. But epikinesis is amazing in VR. 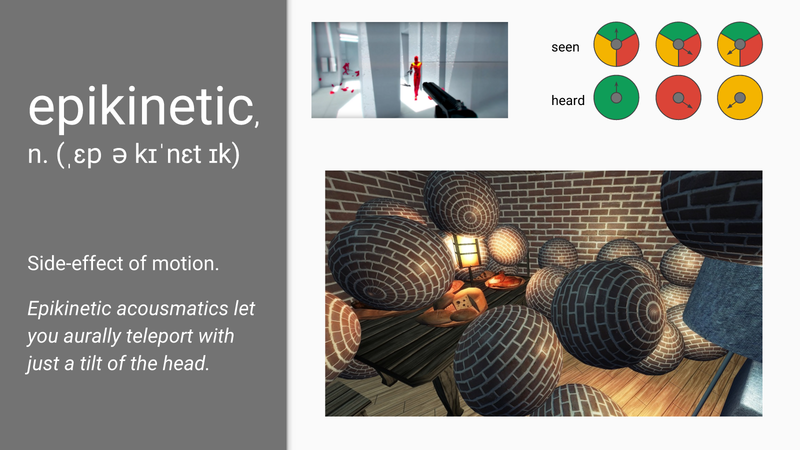 Particularly in first-person POV style VR with body-tracking, it can be mind-blowing. Think about it. Of course your body’s movement gets replicated exactly, translated into movement of your virtual body in the virtual environment; that much is just what’s necessary to simulate spatiality and physics, to make you think you’re in a reality that works like the one you grew up in. But when your body’s movement also causes effects beyond this, you feel viscerally integrated into limitless magic. I don’t really know how to put it in a way that captures just how powerful this effect can be. You are currently reading epikinetic at cmloegcmluin.